The news that the ANZ – our biggest bank – has increased its mortgage lending to record levels in the last quarter and accordingly made huge profits comes as no surprise. What is surprising, though, is that the news is accepted without a scintilla of concern being expressed by those who supposedly run our economy. In the interests of combating inflation, we are told, we have to maintain a strict control over the money supply. Yet by far the greatest factor in increasing the money supply in our economy is bank-created credit – money created out of nothing by private companies in the interests of making profits for their shareholders. There is no mystery about how it is done; the banks constantly lend money that they do not have. They do not deduct the sum lent from the assets they hold but, by agreeing to make the loan and by entering that loan in their accounts, they create a debt which is repayable by the borrower and is therefore an asset in the books of the lending bank. The borrower can use the loan as money and it adds to the quantity of money in the economy. When the loan is eventually repaid, the repayment is treated as an asset in the bank’s accounts. This process, conducted over and over again on a daily basis and on a cumulatively huge scale, is the source of most of the money circulating in our economy. It is subject to virtually no control other than the willingness of the banks to lend. The banks’ preference, of course, is for the easy pickings they can exploit by lending to the residential housing market. That market is largely created by the banks themselves; it offers virtually foolproof returns since it offers ample and easily realised security, continuous demand, and a buoyant market with rising prices which are almost entirely the consequence of the banks’ willingness to create new money. The banks decide, in other words, the size of the market – one that they themselves create. This power to create new money is a straightforward private monopoly. The only attempt at restraint is the price of credit – the interest rate – the fixing of which is handed over to the tender care of a supposedly “independent” (you’ve guessed it) bank! The Reserve Bank’s occasional effort to restrain bank lending, as with the governor’s restriction of the proportion of lending to those with less than 20% deposits, is easily circumvented, as the ANZ has demonstrated. All they had to do was increase the total amount of lending so that the proportion going to those with small deposits fell. The governor may have (perhaps unwittingly) encouraged an increase in the pace of asset inflation. 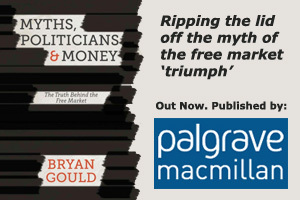 The banks’ ability to dictate the amount and the purpose for which the money they create is used confers on them an astonishingly central role in our economy, yet it is one that is scarcely recognised – and at times is actually denied. Its impact is unique, comprehensive and fundamental. The failure to take it properly into account is one of the major features of our difficulties in managing our economy effectively. The first and most obvious consequence is that the major inflationary impulse in our economy is, and has been for many years, the asset inflation created directly by the banks’ continued willingness to lend into a market whose values are constantly inflated by the volume of money (that is, credit) flowing into it. There is, of course, a secondary economic consequence of that asset inflation. Home-owners who see the value of their properties rising fast are encouraged by the apparent increase in their equity, whether or not immediately realised, to feel better off and therefore more able to spend and consume more freely. This stimulus to consumption will eventually spill over into the threat of consumption-led inflation and a larger trade deficit – both factors which inhibit any prospect of export and production-led growth in the economy. At the same time, the largely ineffectual reliance on raising interest rates to control these inflationary pressures means that there is constant upward pressure on the exchange rate, so that our productive sector finds both its profits margins and market share in international markets under constant threat. And that is on top of the fact that the banks’ preference for lending to home-buyers and their corresponding reluctance to lend for the riskier and less profitable purposes of productive investment means that industry is starved of the very investment capital that has served more successful rival economies so well. The adverse consequences go well beyond the economic. The asset inflation continually transfers wealth to home-owners, and away from those who do not own their homes, who therefore enjoy no equivalent increase in their purchasing power and for whom rising house prices mean an end to any hope of home ownership. This shift in purchasing power from the poor to the rich is undoubtedly a major factor in the growing inequality and poverty in our society. And to cap it all, the huge profits made by our Australian-owned banks are then taken out of the country and transported across the Tasman!